Currently working on the third chapter of the Vic & Ed industrial architecture book, which concerns engineering works. 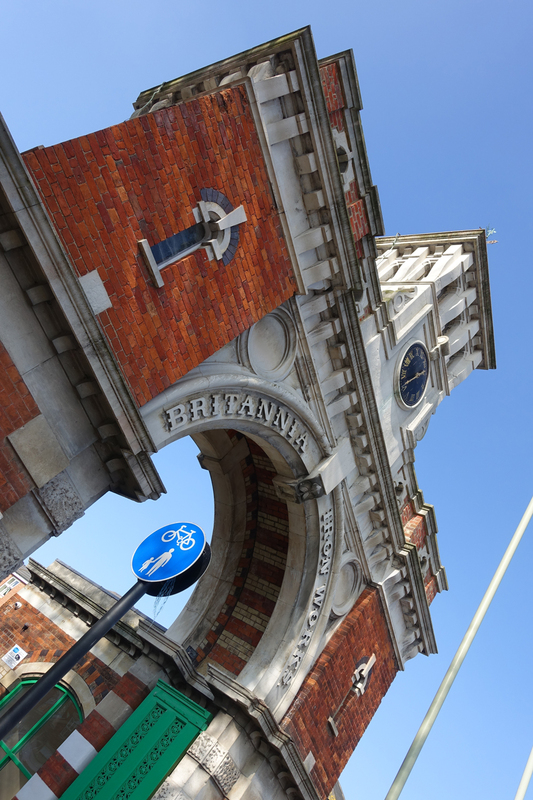 Coincidentally made trip to London (on day of eclipse, which in London was totally eclipsed itself by fog) and thence to Bedford to photograph the old gateway of the Britannia Works, one of several huge engineering works that used to be in Bedford. Thanks to the street furniture – two lamp posts and one cycling sign in the space of about five yards – standing the gateway on its side is the clearest way to see it! I spent about twenty minutes marooned on a traffic island as Bedford’s phenomenal traffic whizzed around me, trying to get a decent shot. At least the sun shone, as it had done earlier in St Neots when I took Paine’s Mill, a wonderfully polychromatic former flour mill (well, a part thereof) dating from about 1907. Now housing, it is hidden away from the main street and quite a surprise when one comes across it amongst low-rise everyday terraces. Just like Monty Python’s ‘home is my castle’ at 35 Acacia Avenue, which was, of course, a castle….